On 19 April Afghanistan made headlines again after the Taliban staged a coordinated assault on a key national security agency that killed at least 64 people and left almost 350 wounded in the deadliest attack in Kabul since 2011. The attack amounted to the beginning of the fighting season between the Taliban and the Afghan authorities and made peace talks with the Islamic group an even more distant prospect. The next months will be crucial for the future of the country, with two decisive conferences on Afghanistan dealing with security (NATO Summit in Warsaw) and funding for development (ministerial meeting co-hosted by the Afghan government and the EU in Brussels) taking place in July and October respectively. This year will also see significant developments in the electoral front, with lower house elections and district council polls (the later for the first time) to be held on 15 October. In the midst of this crossroads for the future of the country, UN Dispatch sat down with Dominic Medley, Spokesperson of the United Nations Assistance Mission in Afghanistan (UNAMA), to discuss the multiple challenges faced by the country and the role of the UN in supporting the Afghan government in achieving peace, stability and prosperity in this battered country. UN Dispatch: Last year saw the second highest number of violent incidents in Afghanistan since 2001 with 11,000 civilian Afghans killed or injured. How would you describe today’s security environment? Dominic Medley: In 2015, the conflict in Afghanistan continued to cause extreme harm to the civilian population. 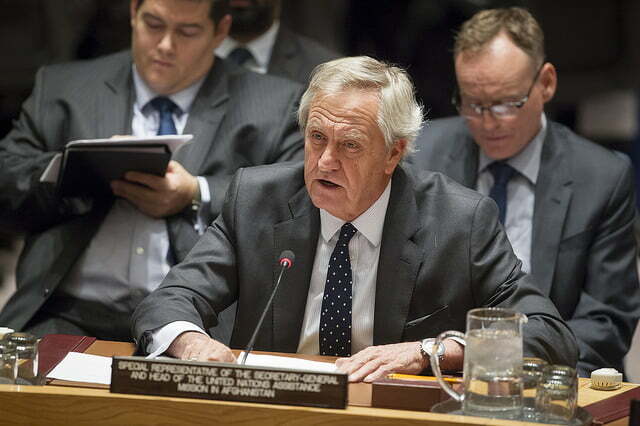 As Nicholas Haysom, Special Representative of the Secretary-General (SRSG) for Afghanistan, last month told the Security Council: “We can expect a difficult fighting season. The Taliban, emboldened by their military successes in Kunduz and elsewhere, will continue to test the Afghan security forces across the country from Helmand in the south to Baghlan province in the north. Yet in this first year of independent command, the Afghan security forces have largely held their own in the face of continuing high rates of attrition.” The first quarter of 2016 has also seen an increase in civilian casualties and a devastating attack in Kabul on 19 April. The UN message has always been clear: attacks against civilians and in civilian-populated areas must cease. UN Dispatch: Tadamichi Yamamoto, who in July will take over from Mr. Haysom as SRSG for Afghanistan, said that the UN is committed to serve as a neutral mediator between the Afghan Government and the Taliban. In what degree is the Taliban engaged in the country’s peace efforts? ; What are their main demands? LAGHMAN, 07 March 2016 – International Women’s Day celebrated in Laghman City, with Governor of Laghman Afghanistan High Peace council members, professional women, students and civil society representatives. Photo by UNAMA / Fardin Waezi. Dominic Medley: Afghans want peace, they deserve peace, but most importantly, they need peace. There have been many efforts in recent months towards peace. The SRSG meets with the Taliban Political Commission and has reiterated that peace in Afghanistan requires an intra-Afghan dialogue that must, by necessity, involve Taliban and Taliban groups. The Taliban have however reiterated that they are not yet ready to engage directly with the Government and just recently announced their latest spring offensive. The United Nations will continue to energetically engage with all stakeholders offering support, assistance, advice, good offices and supplementary channels of communication. UN Dispatch: How worrisome is the presence of ISIS in Afghanistan? Dominic Medley: The presence of so-called ISIS, or Daesh as it’s called here, remains limited in Afghanistan. Recent operations by the Afghan National Defence and Security Forces, supported by international military air strikes, as well as attacks from the Taliban, have led to the concentration of ISIS in remote locations near the border with Pakistan. Daesh is trying to establish a foothold and could still be a serious challenge in the future. To prevent this scenario from becoming a reality, greater regional involvement to address this shared threat is required. UN Dispatch: When UNAMA advises the Afghan government on measures and reforms to strengthen nation building, what are the top-priorities you team focuses on? Dominic Medley: The UN works with the Afghan government and the international community to sustain progress in the country. All the conversations that we have with the Afghan authorities have the ultimate goal of building up a stable and resilient Afghanistan that is not aid-reliant. This requires continued, coherent and effective assistance delivered in a way that ensures Afghan sovereignty, leadership and ownership of the whole nation building process. UN Dispatch: 69% of Afghanistan expenditures are paid by international donors. The Warsaw and Brussels conferences later this year will represent a major global effort to secure vital support to boost the country’s stability. How would success and failure look like in these two major events? NEW YORK, 15 March 2016 – Without a peace process, the sustainability and viability of all efforts to bring stability and prosperity to Afghanistan will be called into question, said Nicholas Haysom, the UN Secretary-General’s Special Representative for Afghanistan, in a briefing to the Security Council today. Dominic Medley: These two conferences are connected. It won’t work if Afghanistan gets funding for its army but no resources for development; or funds for development and no adequate funding for security, and so on. The task now is to show donors that investing in Afghanistan’s security, governance and development is a worthwhile undertaking; that Afghanistan works; and that the money invested in the country reaches its people. The conferences in Warsaw and Brussels should reinforce the international community’s enduring commitment to support Afghanistan. This will not only win the confidence of Afghans in the future of their country, but also the vital trust of those dealing with Afghanistan in so many areas. UN Dispatch: What could the international community do better when addressing Afghanistan’s many threats? Dominic Medley: Over the course of several years the situation in Afghanistan was one of the very top priorities of the international community. Today the world has several competing concerns and challenges that are demanding ever more shrinking resources. Yet threats to Afghanistan are also threats to the world’s stability and of course, to the region’s and its neighbours’, who need to promote dialogue and work together to achieve a stronger and peaceful Afghanistan. To effectively address the security situation, all actors have to pay an active role. It would both result in a more resilient country and create a range of economic opportunities to be seized by the whole region – like the awakening of the regional trade. The world has not taken its eye off Afghanistan, but attention has been diverted and that in itself is yet another threat. UN Dispatch: Recently Mr. Haysom said that, among other threats, the Afghan National Unity Government is challenged by the erosion of “the most precious political commodity: confidence in the future.” Do you see the 15 October parliamentary and district council elections as a turning point in Afghans self-confidence? Dominic Medley: Reforms are essential to restore the trust of the Afghan people in their electoral process and the country institutions. Credible elections, which ultimately reflect the genuine will of the Afghan people, will lead to greater political stability, and strengthen Afghan democracy. In this sense, the upcoming elections could contribute to reassert people’s confidence in the future. Why is a Child Soldier Awaiting Trial in Kabul?